Welcome to another Telemark Tuesday featured photograph of my current favorite ski venue, the Olympic cross-country ski trails at Mount Van Hoevenberg (MVH)! Although we could use a great big snow storm, there is plenty of snow for skiing in the Adirondacks. MVH is in great shape, especially for ski-skating, and has improved every day as a result of the current weather pattern which thankfully features 1-2 inches of daily snowfall. 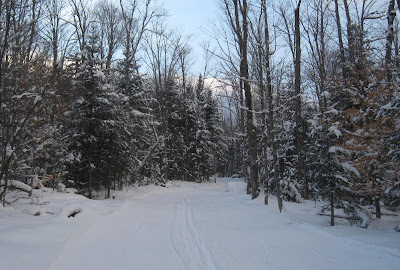 Backcountry skiing in the Adirondacks is still a little boney (rocks may be sticking up), but one is able to ski, especially on open truck trails and access roads. From all reports, Whiteface Mountain has enjoyed a wonderful early season. Despite best intentions, I usually do not make it to Whiteface until after the holidays, however, I am happy to report conditions have been great. The upper mountain (Summit Quad) is open which pleases my intermediate and expert skier friends immensely and thins out the crowds on the lower mountain; everyone is happy. Skiing's great in New York State!